Elementary students from grades one through six are invited to Science on Saturday, a half-day event featuring science experiments and demonstrations, from 8:30 a.m.-1 p.m. Saturday, March 18 in Wallenberg Auditorium in the Alfred Nobel Memorial Hall of Science at Gustavus. Mai Neng Moua, Minneapolis-based author and community builder, who will be on campus in residence all week, will talk about "Cross-cultural Perspectives on Community and Mentoring." 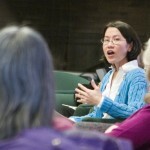 Moua is the editor of the first anthology of Hmong-American literature, Bamboo Among the Oaks, and the founder of the Hmong American Institute for Learning. Gustavus Adolphus College's Student Outreach to Foster Care and Adoption (SOFA) will sponsor Minnesota's Heart Gallery exhibit 9 a.m.-4 p.m. March 6-11 in Linner Lounge in the O.J. Johnson Student Union at the college. The public is invited to the following continuing education events that will be held in the Melva Lind Interpretive Center at Gustavus Adolphus College. 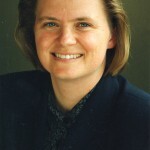 Laura Behling, English professor at Gustavus Adolphus College, was one of three professors in the United States appointed a Washington Internship Institute (WII) Faculty Fellow for the spring 2006 semester by the Association of American Colleges and Universities (AAC&U). Gustavus Adolphus College Students Hope to "Cover Mississippi"
Twenty-three Gustavus students spent January in Ocean Springs, Miss., helping residents recover from the devastation of Hurricane Katrina. Twenty Days in Mississippi, a documentary chronicling the January service trip of 23 Gustavus students, debuted to more than 200 students, faculty, staff, and community members Wednesday night. 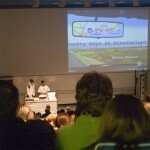 The 28-minute film features images from the area surrounding Ocean Springs, Miss. and interviews with Gulf Coast residents. As part of the St. Peter Reads program, author Michael Perry will appear at 7:30 p.m. Tuesday, March 7 at Trinity Lutheran Church in St. Peter for a discussion and book signing. The public is welcome to attend the 19th annual Transfiguration Series at Gustavus Adolphus College.